A few big problems occur with a lack of glute strength and recruitment when you're cycling. One of the biggest problems is a rider's ability to apply force and accelerate in the saddle. Riders who don't have good glute strength, will tend to compensate by getting out of the seat to accelerate. This is because they lack the ability to engage and recruit the glutes to set up a solid and effective power line through the pedal stroke. So instead, they shift their body weight off the seat and forward to primarily use the quadricep and hamstring muscles. Whilst the quadriceps and hamstring muscles are two other strong muscle groups, they are smaller than the glutes and therefore will fatigue more quickly. One of the results of quadricep and hamstring dominant cycling is early fatigue. So how do we work on developing and utilising the glutes? Strength development can be achieved at low speeds and in the seat whilst on the bike. Whilst on the bike, you may consider including seated standing starts and seated accelerations over 100-200meters rolling in from a slow pace to improve glute recruitment and strength. Riding up hills seated whilst mentally and physically focusing on engaging and recruiting the glute muscles is also be beneficial in developing strength. Improving strength in the gym or at home by completing compound exercises such as squats and deadlifts which require glute engagement will compliment the work you do on the bike. An exercise you can do to primarily focus on the glutes is hip extensions, which can be done on any standard hip extension machine in the gym or on cables/therabands at home. IMPORTANT: To improve muscle recruitment and engagement, you need to focus and visualise the muscle in action. By consciously focusing on the activity, you will train your brain’s neuromuscular coordination which will assist with making the ‘conscious’ activity become ‘sub-conscious’ over time and with repetition. 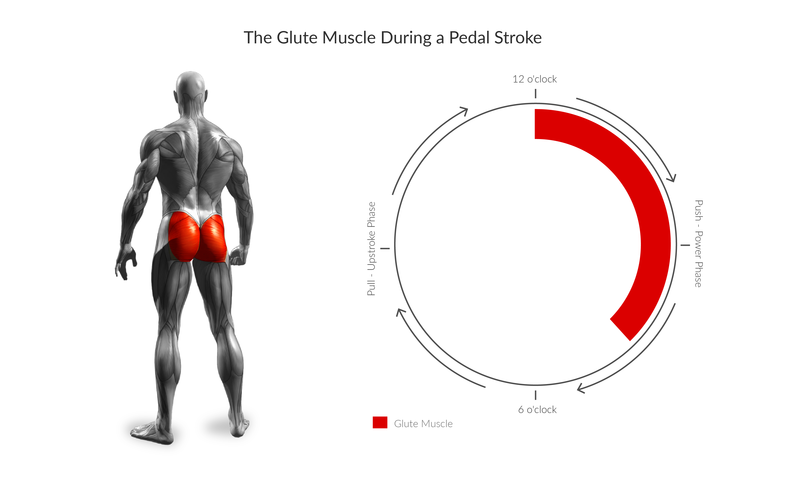 We hope you’ve enjoy this blog, please feel free to drop us a comment below and let us know what you’re doing to engage your glutes on the bike!